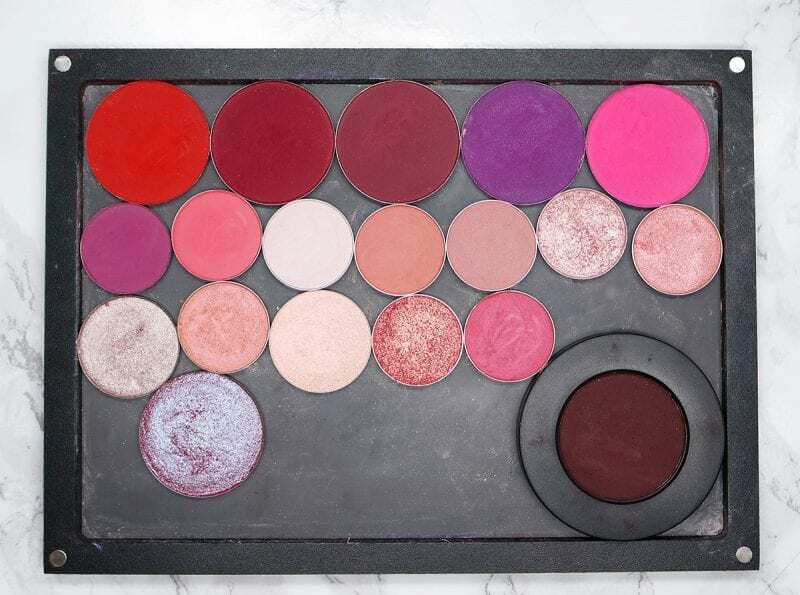 Hey guys, I received a ton of requests to create a DIY Jeffree Star Blood Sugar Palette Dupe for you. Now if you’re in the PhyrraNyx Facebook Group or you’re a YouTube subscriber, you’ll already know that I recommended Angelica Nyqvist’s How to Create Your Own Perfect Jeffree Star Blood Sugar Palette video on this topic. But since you asked, I shopped my makeup stash to create one too. For this DIY I primarily used cruelty free makeup brands Sugarpill and Makeup Geek. I chose mostly pressed eyeshadow singles, but I also included a few awesome loose indie eyeshadows too. I left out the boring neutrals because I feel like most of us have enough neutral shades. Instead, I focused on the reds and duochromes. The Jeffree Star Blood Sugar Palette is $52 and filled with 18 different eyeshadows in a range of matte, metallic and pressed glitter formula. This palette apparently sold out in less than 3 minutes and many people missed out on it, so I hope my Jeffree Star Blood Sugar Palette Dupe helps to satisfy that makeup craving. The Blood Sugar Palette won’t be shipping for 4 to 5 weeks, while my dupes are available now. It is 100% vegan and cruelty free, just not drama free. Some shades are not considered eye safe in the USA. While I loved my Jeffree Star Beauty Killer Palette, I’m not currently buying things from JSC. Yes, I’m aware he’s made an apology for past behavior. I’m still waiting to see if he changes. An apology only matters if someone truly changes their behavior. 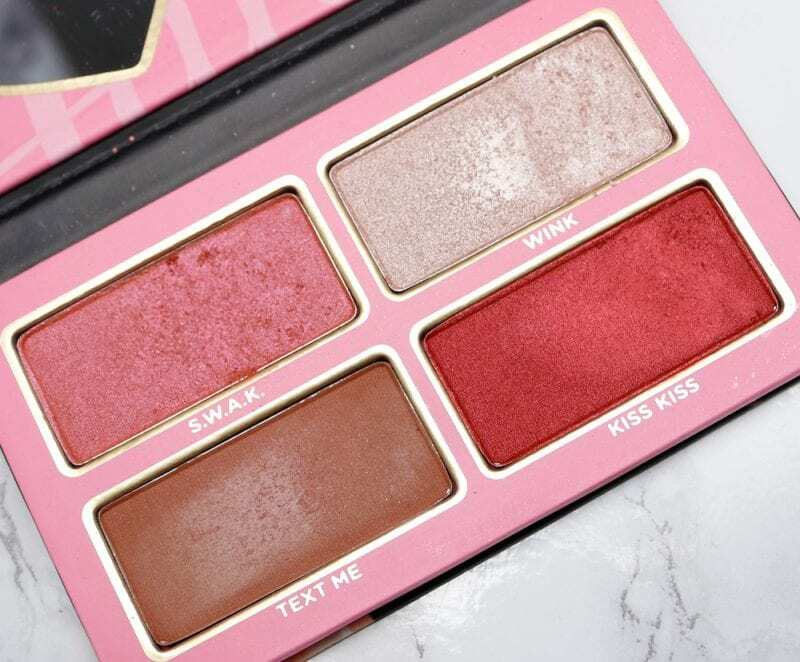 Strangely enough, the Jeffree Star Blood Sugar Palette also looks similar to the upcoming Lime Crime Venus XL palette, which was leaked recently. I think the eyeshadows that I chose for my DIY Jeffree Star Blood Sugar Palette dupe has shades you’ll find in both palettes. 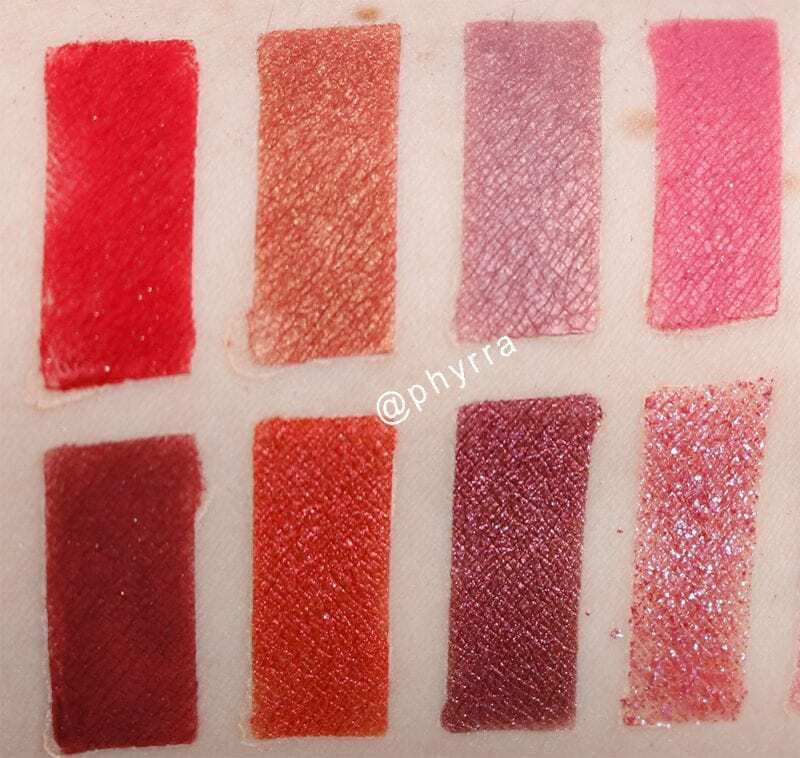 My single pressed eyeshadows that I used to create my Jeffree Star Blood Sugar dupes. Some of my indie loose eyeshadows that I included for extra reds because I love red eyeshadow. My Sugarpill Feline Fancy Palette, which I used for dupes. I included 3 of the 4 shades in the palette. It’s funny to me that most people didn’t like this palette, yet the colors in it are now coveted. Anastasia Beverly Hills Buon Fresco – This pinky-grey taupe matte is an excellent transition color with reds, purples, pinks and burgundies. It’s one of my all-time favorite transition shades. Makeup Geek Tuscan Sun – Salmon pink matte. This makes for a beautiful crease color. Colour Pop Poodle – Rich hot pink matte. You know I bought this for the name. Sugarpill Poison Plum – Vivid warm purple matte. Colour Pop 143 – Intense pinky purple matte. Sugarpill 2am is similar, but it always fades on me while 143 stays vibrant. Suva Beauty Hookah – Warm-toned burgundy matte. I love this color so much. Sugarpill Kiss Kiss – Vibrant foiled red. This is the only shimmery color in this set of swatches. Makeup Geek Cupcake – Medium soft pink matte. Anastasia Beverly Hills Baby Cakes – I really like this pastel pink matte as a matte highlight or base shade. Sugarpill Dollipop – Neon hot pink matte. Melt Meanstreak – Deep plum matte. I love using this color to deepen the outer v or as a liner. Suva Beauty Denarau – Cool-toned burgundy matte. Sugarpill Love+ – Bright red satin-matte. You’ve got some ‘safe’ colors with Cupcake, Baby Cakes, Buon Fresco and Tuscan Sun. Poodle is where things start to get lively. Dollipop, Poison Plum and 143 are blindingly bright. Kiss Kiss, Love+ Hookah, and Denarau give you many different takes on red and burgundy. Meanstreak is especially the perfect deep shade for these colors without being black. It looks so good with purples, pinks, reds, and burgundies. Nabla Millennium – A pale gold duochrome with coral-pink shift. This actually reminds me a bit of Melt Skeleton Kiss. Nabla Mystic – A metallic mauve with pink champagne shift. Probably the most subtle shade in the palette. Makeup Geek Nostalgic – Foiled bubblegum pink metallic. Sugarpill Wink – Baby pink champagne shimmer. JD Glow Cleopatra – Rosy pink base with maroon, teal blue, purple, pink and orange shifts and sparkle. This color is pretty for layering on top of other shades. Makeup Geek Wild Fire – Coral red with gold shift. Makeup Geek Mai Tai – Apricot base with orchid pink shift. Anastasia Beverly Hills Ballet – Metallic seashell pink. Sugarpill Swak – Foiled rose petal red with pink and gold duochrome. For example, you could use Millennium, Mai Tai, Wild Fire and Swak together to create beautiful unique looks since they all have varying hues of gold, pink and red. My Pretty Zombie Epistaxis – Fresh nosebleed red matte. My Pretty Zombie Fresh Scab – Dark red matte. Darling Girl Hell’s Belles – Red with gold duochrome. This one has been discontinued so try My Pretty Zombie Brisket. Sugarpill Asylum – Dramatic metallic red sparkle. Aromaleigh Hecate – A soft smoky plum. I see red and soft purple in this one. Sugarpill Countess – Metallic burgundy with aqua blue sparks. It looks like Prick is a bright warm red, Cherry Soda is a neutral red, Fresh Meat is a cool red, Blood Sugar is a shimmery red and Extraction is a deep cool burgundy. 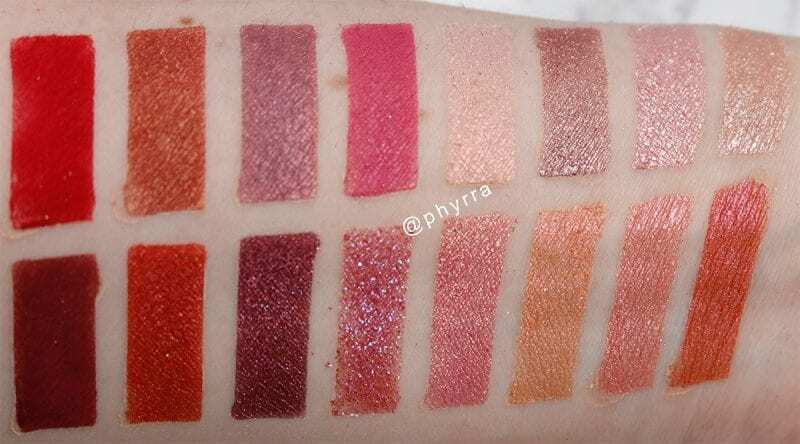 I’ve got you covered for all types of reds with Love+ (bright red), Hookah (warm burgundy), Denarau (cool burgundy), Kiss Kiss (shimmery red), Asylum (metallic red), Countess (metallic burgundy), Epistaxis (bright red) and Fresh Scab (dark red). Again, as I mentioned, I didn’t do a straight 1 to 1 Jeffree Star Blood Sugar Palette dupe with these eyeshadows. What I made is far more interesting thanks to the extra mattes and duochromes. Notably, shades like Millennium, Mystic, Cleopatra, Wild Fire, Mai Tai, Ballet and Swak in particular let you add dimension and depth when paired with the mattes. 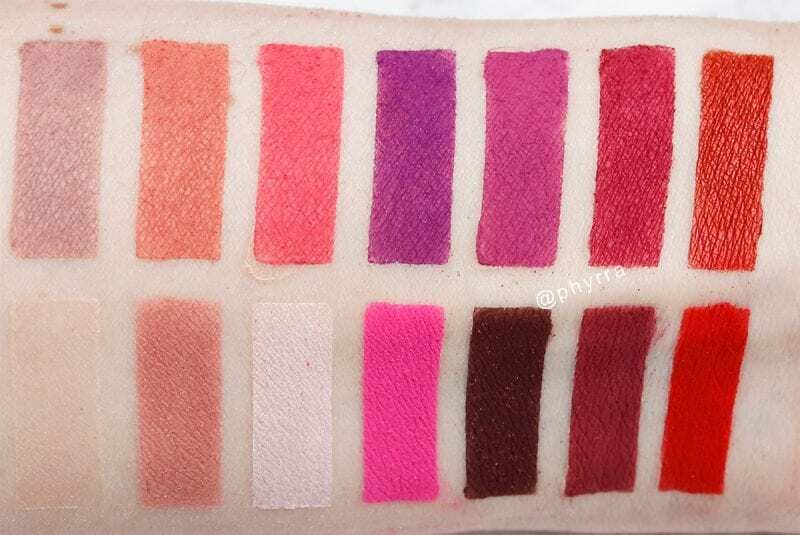 What do you think of my DIY Jeffree Star Blood Sugar Palette Dupe? How would you wear these colors? Urban Decay Backtalk Palette is Coming Soon! Next articleUrban Decay Backtalk Palette is Coming Soon! I like these suggestions better than the Jeffree Star palette swatches!! Would you do more blog posts like this, where you improve upon what an actual palette’s colors are, and add your own? It could be an “Inspired by X Palette” series. Thank you so much for doing this! It is great to have an alternative when you miss out. Ohhh this is really neat! I love Jeffree Star. This is so cool. I cannot tell you how much I appreciate you doing this! I desperately wanted the J* palette but was out of the house when it launched. An hour later, when i returned, it wasn’t available (and of course the shocking news it had sold out in 5 minutes or something). I love J* shadows and, unlike a lot of people, have no issue buying the brand. After what happened, however, I may never purchase J* again. It’s inexcusable for a major brand to pan so poorly a hyped release. Clearly it was obvious what demand was there and yet the brand failed to adequately prepare. Whether true or not, it feels like the brand was trying to create hysteria to build up numbers for pre-orders. Your “dupe” palette is fantastic. I think the colors and finishes are beautifully thought out. I’ve already purchased an empty palette to try to put together your re-creation. Thanks again! 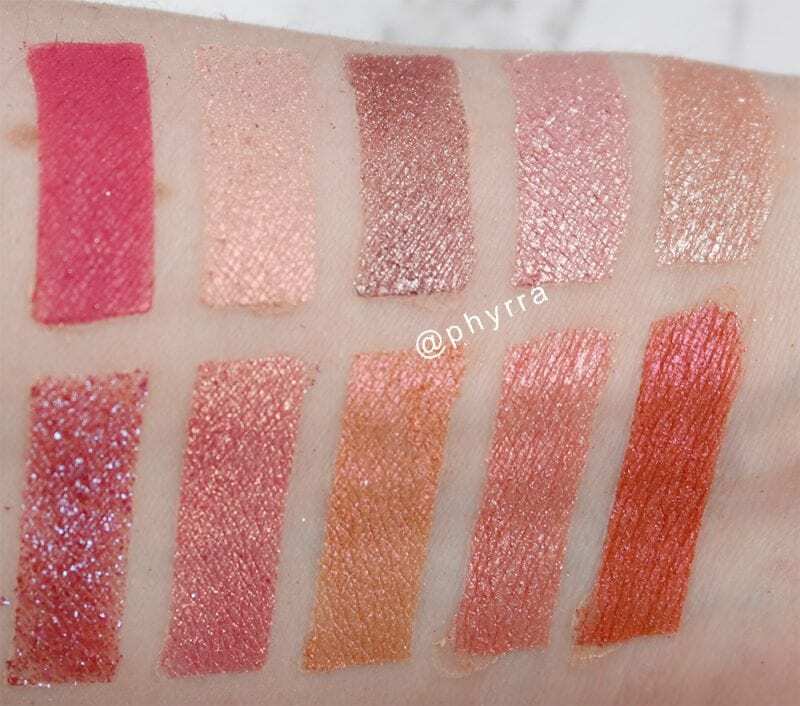 Gorgeous swatches and dupe palettes. I need to get out of my comfort zone and wear red eyeshadow! I think I like your selections better than the actual Blood Sugar Palette itself! p.s: just sent a request to join your FB group! Thinking that this has to be my favorite palettes yet. Love those bold and flirty shades of pink. Such a vibrant palette!!! Perfect for Valentine’s Day!! They are beautiful bright shades, not in my wheelhouse but gorgeous! Great finds and amazing swatches. It feels so amazing to find such close dupes of something so raved. I don’t feel like I can wear red on my eyes because of how red my skin is but I can always appreciate a good dupe posting! Especially when money is tight over here and I have the need to “shop my stash”! So many beautiful dupes! I’m kind of a chicken with color because I feel so inexperienced, but I love the color assortment. You picked some gorgeous colors for your dupes. I like that you went across different brands instead of sticking to just one or two as well. I’m going to look into getting a few of these. You should design palettes, Courtney! I like the colors in yours way better than in JSC. I love seeing you use these colors! Especially the bold purple shirt because I just can’t seem to do it myself but it always looks so good when you use them! Great alternatives! Some of the JSC products are appealing to me but I’m not comfortable giving my business to the brand either. 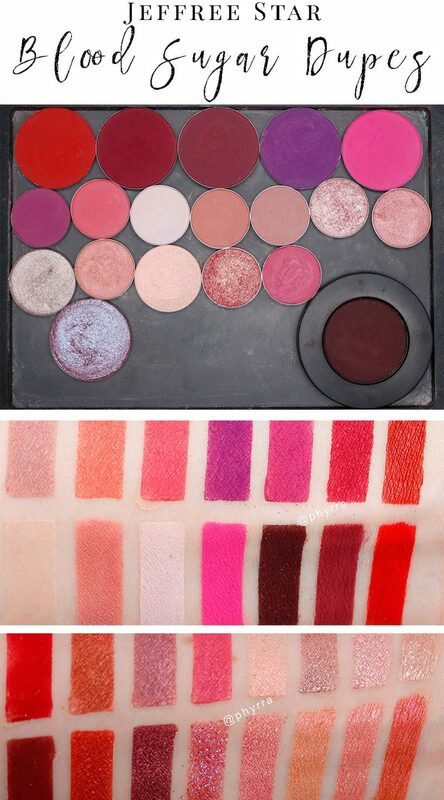 I don’t think the full palette is overall right for me, but this is such a great post! There are a few colours I do like (just not enough to buy the full palette) so knowing what singles I could pick up instead is even better! sold out in a matter of minutes. That’s amazing for Jeffrey. I love the dupes. I don’t think I’ll be buying his palette though. I love the pigmentation but I have sooo much makeup its not even funny. I laughed when you said you left out the boring neutrals since I’m a boring neutral type! But it’s the shades you duped that made this the hot seller. As usual your swatches are great and so helpful. These are all beautiful colors. You can make so many different looks with them, too. I’m really loving “Kiss Kiss” and “Wildfire”. This is great! I am not a makeup junkie, but having this dupes list I can look like I know what I’m doing without having to shell out the price! 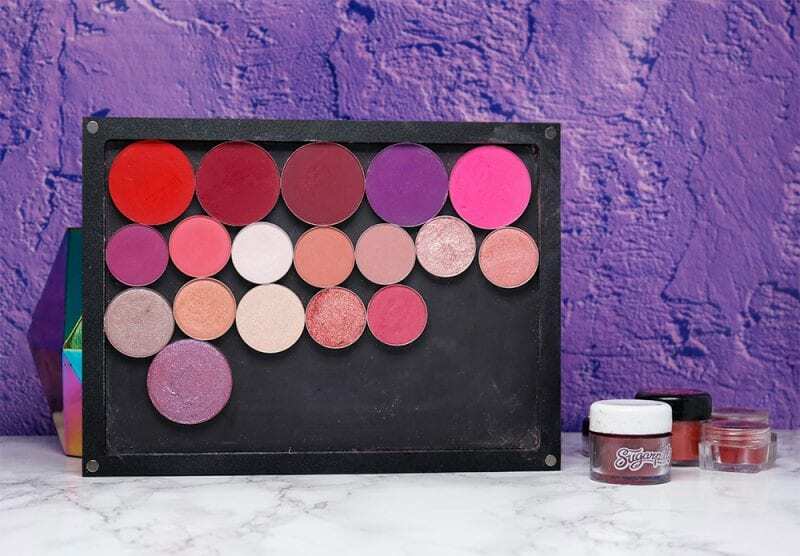 This is helpful for the ultimate makeup junkies! Sold out in THREE minutes? WOW! How many were in stock, I wonder! Your swatches and dupes are really great. I think that I may have missed out on the latest drama, but I can just imagine! The last video that I saw was his review of the Kylie brush set. Excellent! Since I consider peaches “neutrals”, there are even selections for me. I adore Cleopatra especially.